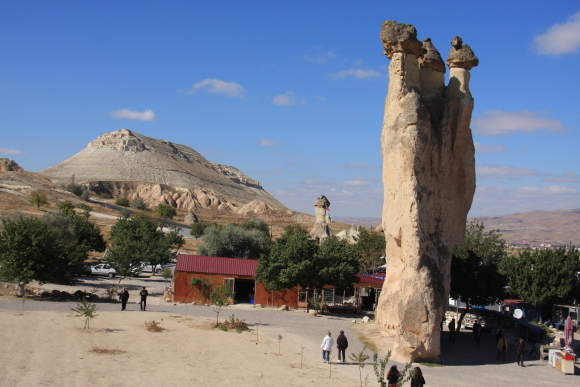 Cappadociais a plateau in the Anatolian plateau center of more than 1000 meters above sealevel , rock zone is spread over 100km ² near . 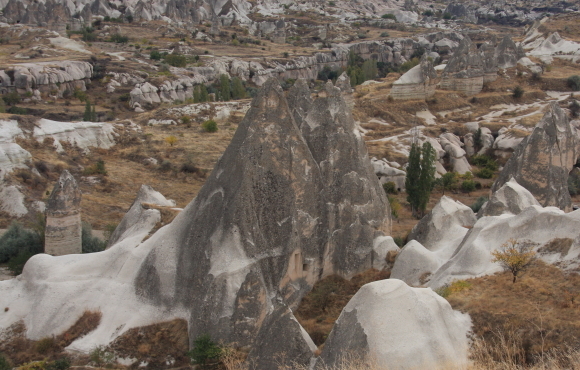 Rock formations shaped like achimney and mushrooms mushroom , landscape boulders towering is a wonder ofnature exactly . 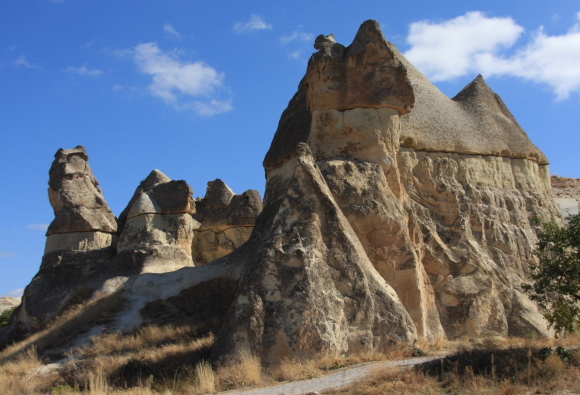 This mysterious landscape was created by eroded hard and softstrata strata overlap. 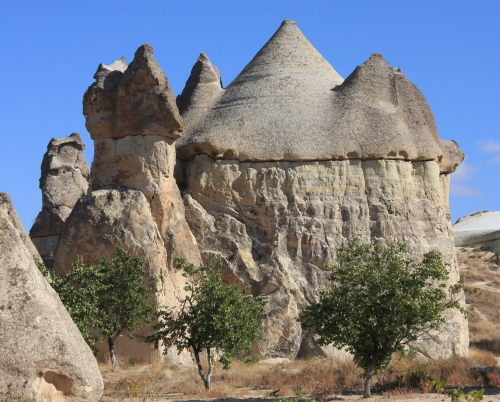 InCappadocia the hidden life of Christians was told in this land of rockformations. 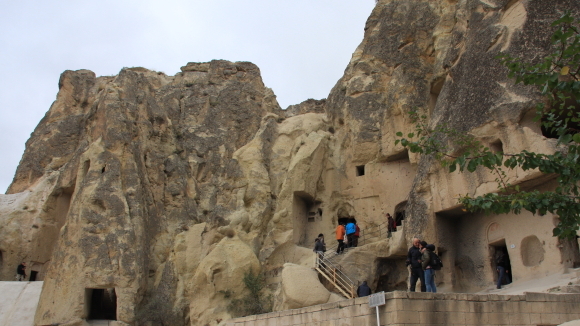 Monks of Christian fled the oppression of the Roman Empire , wasmoved to Cappadocia . 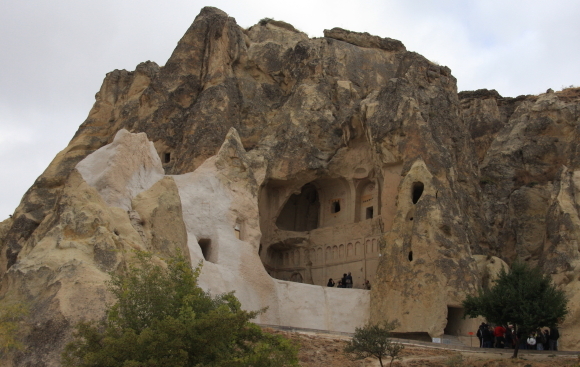 They make the church and residence in hollowed out softrock . 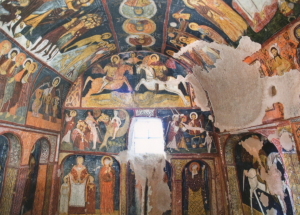 The cave church which was made in the 12th century , frescoes of thetime is just left because the light does not sting . Besieged by Islamic Persiaand in this area , Christians had been threatened constantly . They askedunderground place to hide temporarily from enemy for it. Underground city wasdiscovered in 1965 , is a huge span eight floors underground , to 65 m depth .It was promoted to dig freely according wine factory on the first floorbasement , dining room on the second floor of the basement , living room ,bedroom , in capacity . The passage connecting the fifth floor underground , inorder to block the passage when the enemy has been hit , there was alsomechanism to close the passage and rolled even one ton of the big stones . Aspace of the bottom layer has become a church that was dug in the shape of thecross . 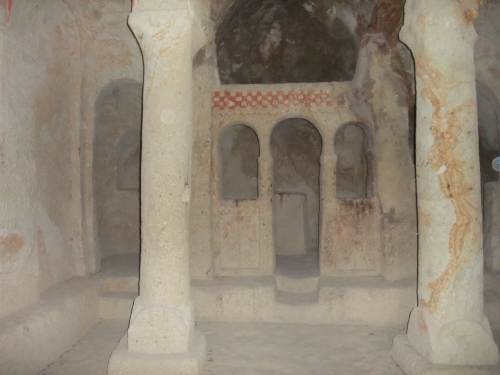 The bottom most of the underground city , Christians of Cappadocia , Iwas a forum of prayer to God. 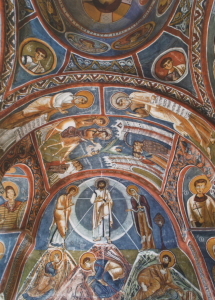 St.Basil who worked the bishop of Kaisaria (present Kayseri) by the most importantChristianity theologian in the 4th century supported mentally the Christian whomoved to Cappadocia. 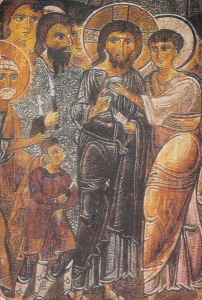 St.Basi built young Christians' lodging and made Kaisaria the center of theChristianity of this district.The Trinity theory of a father, a child, and theHoly Spirit was advocated, Rebun of holy body courtesy was improved, thetheology of Christianity was established, and it was venerated as a Saint. Itwas venerated as a Saint.It left the word of "not owning more things whichlove a neighbor and love a neighbor than a neighbor. 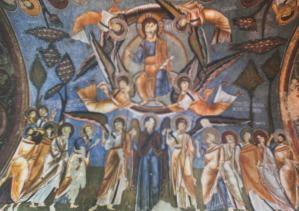 "The Christians whomoved to Cappadocia were doing the humble life of self-sufficiency according tothe instruction of St. Basi. 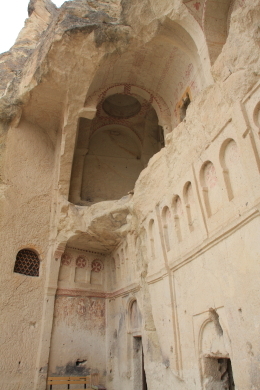 Manymarks of the dining-room and bed where Christians lived are also seen, andbusiness of them life is felt for a Goreme field museum.Many cave churches werealso saved and many fresco painting in early stages of Byzantine oneremains.Since the cave church was made by the place which light does notinsert, the preservation state of fresco painting is good and the color ofthose days remains vividly. 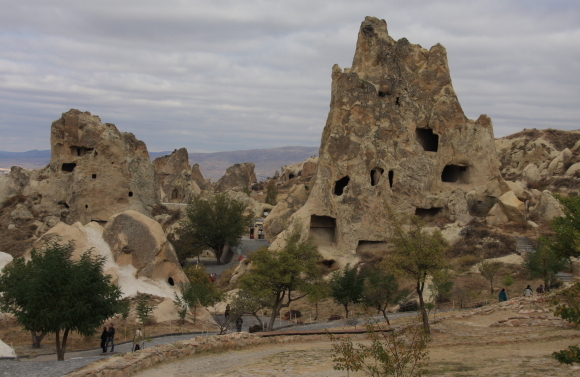 Christianswho moved to Cappadocia, has established many underground cities to hidethemselves temporarily from the enemy. The Oyobi 5 basement, to 65 m depth, andwas promoted to dig freely according wine factory, dining, living room,bedroom, in capacity. In order to block the invasion of the enemy, and I alsomade trick to close the passageway also rolled one ton of the big stones. 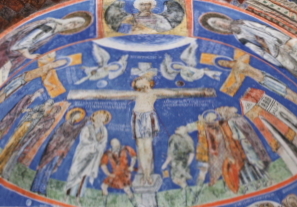 Itseems to have a forum of prayer to God that was dug in the shape of a cross inthe bottom layer. 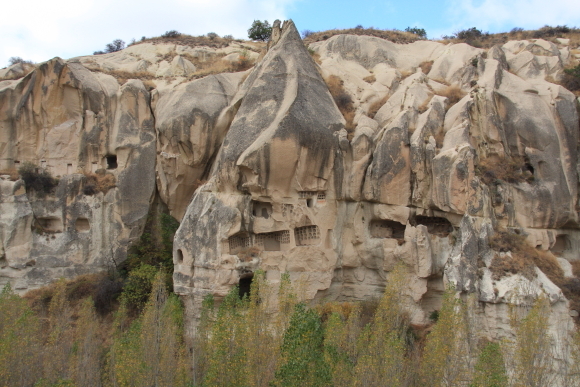 Thedwellings of the Goreme Open Air Museum, a cave with a church and residence ismade towards the rock, up-down is severe, harsh life of Christians at the timewere suggesting. I did not go this time, but the ceiling is low enough to nothave to walk and bent over to the Kaymakli underground city, because it seemsto form an underground city that spans five floors underground, even more than50 meters depth, it seems to have been terribly harsh living environment. 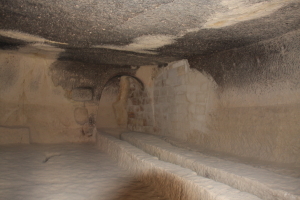 About2000 people are living in the underground city of Kaymakli this, people of 12000 or more people seems to have lived Taken together Atsuta underground city300 or more at that time. Life of Christians at the time you hiding such aplace, was protecting the faith of their own is imagination, there wassomething deep irrigation.